Report for the period since the 17th Congress the Party’s tasks until the 19th Congress. International Developments. Developments in the EU. The international Communist and Anti-Imperialist Movement. Economic developments in Greece. Developments in political and social correlations. Report ofthe Party’s action. The Party’s tasks until the 19th Congress. In the first chapter, the CC assessed that it was important, underpresent conditions, to pay special attention to analysing international economic developments and especially the trend to changing correlationson the global market and in intra-imperialist centres, in the economic, military and diplomatic spheres. Reference is made to the hot spots ofwar that have developed and continue to do so. In this chapter emphasisis placed on the alarm prevailing in imperialist centres over the possibility that a deeper and more synchronised financial crisis will manifest itself, and on concerns over how to manage it in order to savethe system. The CC’s Theses point out that the constantly worsening position of the working class and self-employed persons in thecountries of developed capitalism is a decisive development affecting the mood of the popular forces and, consequently, the line of struggle by the labour movement, and the communist parties’ strategy. In the second chapter, owing to the significance of developments in the EU for Greece and the popular movement, the basic elements are set out regarding the EU market and internal conflicts and antagonisms. Emphasis is placed on recent decisions concerning state violence and repression, labour relations, and the superstructure of institutions, mechanisms and laws that have been adopted by the member states. The third chapter about the international Communist and anti-imperialist movement contains a report of the Party’s actions and contribution, as well as an assessment of the state of crisis that still exists in the international communist movement. The course of the Party’s action is described in its effort to assist the regrouping of the international communist movement and in particular the need for coordination and joint action by the Marxist-Leninist parties that believe in the need for struggle to overthrow the capitalist system and achieve the passage to socialism-communism. In the fourth chapter, facts are provided about the course of the Greek economy, the export of capital and the active participation in imperialist interventions aiming to control markets. Special weight isattached to developments related to the upgraded status of Greece in the Balkans in the period of the consolidation and growth of the capitalist system in the former socialist countries, as a result of the counterrevolution. Evaluations and facts are provided about the process of the accumulation and centralisation of capital, and the strengthening of monopoly groups with headquarters in Greece on the international capitalist market. The main conclusion is that during the past four years, the results have become more visible of efforts by the Greek bourgeois class to manage, to its own benefit, the market share changes taking place among the most powerful imperialist countries, by seeking to upgrade its own geostrategic role. A discussion is developed about the countervailing currents that have appeared and affect the upgraded position of the Greek bourgeois class in the Balkans, which was achieved during the 1990s and continues to this time. The factors are highlighted that could cause a possible decline in this position, to the extent that other Balkan powers may achieve more dynamic capitalist development. The possibility is also noted in particular that the crisis may appear earlier in the Greek economy than in some other Balkan economies, chiefly that of Romania. An account is given of the situation of the working people, focusing mainly on developments in: the composition of the society, the structure of workers’ employment, the structural changes in the Greek economy, and disparate internal development. The focal points of bourgeois economic policy for the period to come are judged, as are its repercussions on the working class, poor farmers and the self-employed. The assessments of these developments and trends are directly related to the role of the labour movement and the Party in our country, and their role in the correlation of forces and in developments. The fifth chapter assesses political developments since the 17th Congress, the parties’ policies and the stance of the natural agencies of the bourgeois class toward the system of the alternation of two parties in governance. Also taken into account are certain positive processes occurring in the minds of the people, as well as the objective factors that lead to the rise of reformism and opportunism. The struggles that took place are assessed, as are the role and responsibilities of the Party in developing class consciousness, and in promoting political vigilance, the necessity and possibility of forming the Front, and the struggle for overthrow at the level of power. The sixth chapter contains the basic elements of the Party’s report, based on the main task set by the 17th Congress for the overall ideological, political and organisational reinforcement that is anecessary condition for building the Anti-imperialist Anti-monopoly Democratic Front (AADF) and for advancing the anti-imperialist, anti-monopoly struggle The main evaluation is that, during the period that has elapsed since the 17th Congress, the Party has done systematicand persistent work to foster assimilation of its strategy andProgramme, to encourage united action based on the strategy and toadapt and specialise it by sector and branch, on the basis ofdevelopments and the needs of the political confrontation. KKE is today more experienced and steeled to act under any conditions whatsoever. Its dynamic ideological and political intervention in the confrontation with the bourgeois political forces and opportunism, in conjunctionwith its vanguard contribution to developing the class struggle and other struggles, contributed to obstructing the plans of the governmentand the bourgeois class to pass reactionary reforms easily. The general progress of KNE and its dynamic vanguard role in the struggles of young people was judged to be good. The need is pointed out to strengthen the Party’s help to the Central Council and organs of KNE, as well as to its base organisations, so that they can absorb new members and secure their active participation in actions and decisions. Communist education is absolutely necessary in the transitional age andphase of the forces of KNE. This effort must be constant in order tosucceed, since the ranks of KNE are renewed fairly rapidly, and this will have a direct constructive effect on building KNE, but also on thegrowth of a strong youth movement. At the same time, concern is expressed over the delay in the analogous progress of building the Party in the working class by sectors and workplaces. The factors are cited that did not function in the required comprehensive and decisive way, for which the Party and above all the CC is to blame, so that there is some correspondence between building the party and the social composition of the Party’s ranks. The general conclusion is that, despite the weaknesses and problems, some of which remain, better conditions have been created for the party’s more dynamic progress in the years to come. This is followed by an evaluation of the work of the CC, the Political Bureau and Secretariat, and the auxiliary Sections of the CC. In the seventh chapter, the CC proposes the main tasks for the Party until the 19th Congress. The CC calls on Party members, and on the members and cadres of KNE, to study the Theses and to take an active part in discussing them withinthe party as well as in public dialogue. The Theses for the 18th Congress, through the publicity they will receive and through the members’ individual and collective work, must reach the largest possible number of friends and followers, associates, workers and employees, self-employed persons, farmers, young people and women so that that their opinions, proposals and critical remarks canbe gathered together and studied. So that the Congress documents can be enriched with conclusions on which light has been shed by the experience of all people who look forward to radical change, who want to resist and hinder the passage of new reactionary measures, and to test the power of popular resistance and counterattack. 1. Intra-imperialist rivalries are evolving on all levels – economic, military and political – and between the various groups of states as well. It is even being manifested in the field of environmental policy, between transnational monopolies as well as capitalist states. The hot spots of war that appeared after the creation of new markets in the former socialist countries are still hot, or at risk of being kindled anew, as rivalry is intensifying, above all, to control the sources and pipelines of oil and natural gas. Under these conditions, the US and NATO are deploying new missiles in Europe; while the US fomented the Georgian offensive against South Ossetia that provoked the response by Russia. The Caucasus region is becoming a hot zone of US-Russian competition, entailing new dangers of a more general conflagration in the region, in which the EU, NATO, Turkey and other forces are also involved. Rivalry is intensifying as regards the military presence and political influence of various imperialist centres in Central Asia, the Middle East, Africa and Latin America, as well as in the Arctic. Military spending is increasing, as are arms exports and plans to produce and deploy new nuclear weapons. 2. International Law, as the peoples knew it during the period in which the socialist system was energetically present and active in international affairs, no longer exists. It has been totally replaced by the imperialist doctrine of the "pre-emptive strike", and of the campaign "against terrorism." A particularly dangerous strategy is that of imperialist interventions that invoke what is called "self-determination" as a pretext to stir up minority issues and create protectorate states. The quests and concerns regarding the so-called "reform of the UN", the "new security systems" in Europe and proclamations on a global level regarding a "multipolar world" reflect the trend of change in the correlation between imperialist centres, as well as their united effort against the peoples, in order to disguise the aggressive character of imperialist alliances and associations. The opportunistic disorientation regarding the so-called humanisation of the UN contributes to this cover up. War, violence, extortion and intimidation, the state threat and terrorism are inherent in the exploitive nature of the capitalist system, especially at its highest level, imperialism. a) the trend towards changes in the correlation of forces in the world market continues to deepen, has become predominant throughout the past four years and is manifested by: the decline of the US share of global GDP; the rise of China; the improvement of the EU share, even though its labour productivity has not reached that of the US; and the gradual improvement in the position of Russia, India and even Brazil in the Gross World Product (GWP). The USA continues to hold first place, with the 27-member EU as a whole in second. Based on the criterion of its share of Gross World Product, measured in units of equivalent buying power, China rose to second place (unless the EU is counted as a whole), thus surpassing Japan and Germany in the past three years. But its per capita GDP and the average productivity of its labour force continue to be low. The so-called advanced economies (31 states altogether, according to the IMF list, among which are the US, Japan and the Eurozone) possess 56.4% of the gross world product, while the emerging-developing economies (Africa, Asia, Middle East, Latin America and other countries of the Western Hemisphere, Central and Eastern Europe and the CIS, a total of 141 states) possess 43.6%. b) The last quarter of 2007 presented a slight slowing of global capitalist development, which continued and deepened in 2008, with signs that it might evolve into a crisis. In the advanced economies, the decline is more obvious. The rate of growth of the Gross World Product was 1.3% in 2008-2007, against 2.7% in 2007-2006 and 3% in 2006-2005. 4. The slow-down was initially manifested with a crisis in the circulation of finance capital (the financial sector), which reflected the crisis in the US construction industry and elsewhere. This was a crisis of the over-accumulation of capital in the US economy, which was in a state of evolution, with visible repercussions on the advanced economies and in particular on the EU. The imperialist centres are concerned about the stability of the system, in face of the possibility of a deeper and more synchronised crisis, taking into account factors such as: the manifest crisis in the US economy; the tendency to underestimate financial capital in the economies of powerful EU member states; the slowdown in Japan and in the 27-member EU; their impact on the global economy, in conjunction with the fact that 6-7 years of revitalisation and growth have already elapsed; and the rising international prices of oil and food. Bourgeois governments, persisting firmly in their strategic choices of deregulating markets and restricting the income of the working people, are concerned about the prospect of having to deal simultaneously with reductions in foreign trade and direct foreign investments together with a decline in domestic demand. 5. The contradictions that govern bourgeois choices in managing the crisis are becoming more visible. The international capitalist economy has had to face three relatively severe crises since the early 1970s. Thus, bourgeois policy has passed gradually from Keynesian to the liberal management of the past three decades. Significant elements of this neo-liberal management have been the "deregulation" of strategic sectors of the economy from state protection and the worsening of labour relations that has brought about a reduction in the people’s real income. At the same time, a certain level of popular consumption was maintained by the increase of mortgage and personal loans, the expansion of which became explosive under the pressure exerted on them by profiteering. Bourgeois economists are talking about a "new period of stagflation", while neo-Keynesian concerns are being reinforced, mainly in terms of the need to maintain a large percentage of state shares in companies of strategic importance. Concerns about the management of the crisis have turned to a new and extensive international interstate regulation of the movement of financial capital by the IMF, the World Bank, the international discount market, G8 etc. These are worries about an international capitalist system with a high degree of accumulation and concentration of capital and with the highest degree of deregulation in its movement since the depression of 1929-1932. 6. The basic conflict between the social nature of production and the private appropriation of its output has become sharper. There is a general worsening in the position of the working class and self-employed persons in the countries of developed capitalism. For example, in the US, the 400 richest people increased their fortune by 23% in 2007-2006, while in the two-year period between 2006 and 2007 the number of uninsured and partially insured working people rose to 34.7% of the total (data from a report by the International Institute for Economic Development). Generally, the sharpening of monopoly competition in the international capitalist market increased the prevalence of relative and absolute poverty even in the most developed capitalist economies, downgraded the people’s standard of living and the protection of the public health (e.g. environmental pollution). The promotion of capitalist restructurings has affected the internal differentiation of the working class. With privatisations and the "deregulation" of sectors of strategic importance (energy, telecommunications, etc.) flexible labour relations have spread to include a large number of salaried people, not only in private companies, but also in formerly state-controlled productive enterprises. Objectively, these segments of the working class, particularly younger people, can more easily be aroused. At the same time, the ruling class is adjusting its policy of social alliances by buying off some of the salaried workers in monopoly groups, while at the same time supporting the reproduction of a significant segment of the middle strata, especially those employed in new technologies. The rapid rise in the prices of fuel and food provokes the people’s anger, despite the fact that they are aware of the deeper reasons for these increases. The higher price of oil expresses: the decline of the dollar exchange rate; the conflicts and competition for shares of the international capitalist market in energy material, since the incentive of production is to secure the profits of monopoly groups at all stages between extraction and consumption, i.e. refinement, transportation, wholesale and retail sales; the moves of the imperialist forces that produce and control oil reserves to strengthen their position; profiteering action in commodity markets through the buying and selling of futures; excessive state taxation, which is then used to finance big capital; and assurance of a high rate of profits through prompt measures to limit production and curb falling prices, owing to increased supply. C. The problem of the environment and the illusory way out of the "green economy"
7. The visible climate changes, the overheating of the planet – which, to some degree, is the result of anarchic development based on the criterion of capitalist profit and the commercialisation of land and energy – are exploited by various imperialist centres to develop a new market for energy conservation technology products, as well as the trade in pollutants. Some agencies frequently present the causes of the phenomenon of climate change in a fragmentary way and inflate its consequences. The management of such problems is put forward as the "green economy", detached from the nature of the ownership of the centralised means of production and power. It has certain analogies with the "new economy" of extensive investments in the fields of telecommunications and information technology in the 1990s. It includes investments in innovative energy technologies covering a wide range of industries, from energy and construction to manufacturing, such as the automobile and food industries. The Kyoto Protocol creates a new capitalist market for trade in pollutants. The right to "pollute" is traded for a price on the carbon dioxide "stock market". Significant state subsidies are allocated to monopoly groups for applications in the so-called "green economy". The EU is in the front ranks of promoting the "green economy", owing to the fact that it is seriously behind the US and Russia in controlling the sources and routes of oil and natural gas. Its dependence on mineral sources of energy is expected to increase from the 2000 level of 50% to 70% in 2020, unless alternative forms of energy are further developed. Thus it is oriented towards support of various energy sources and technologies (renewable sources of energy, nuclear fission and fusion) as well as measures to conserve energy, which it describes as environmental protection measures. At the same time, it seeks to create a binding global statutory framework for reducing greenhouse gases, the Kyoto Protocol, which met with objections from the US, Australia, etc. The goal of limiting the production of pollutants is utilised in imperialist competition to divide up markets and to curb the dynamics of China, Russia and emerging powers such as Brazil, who demand more favourable treatment in the international money and commodity markets. In order to secure alliances with popular support, governments initiate campaigns to "raise popular consciousness about the environment", above all in the schools, with support for NGOs, etc. 8. The visible restructuring of imperialist alliances and rival poles, with the gradual rapprochement of Russia and Germany is a significant development. At the same time, the collaboration between Russia and China is growing. The upgraded presence and strengthening of Russia, China, India, Brazil and regional associations such as the Shanghai Cooperation Organisation (Shanghai Group), Association of Southeast Asian Nations (ASEAN), Union of South American Nations (UNASUR) and others, tends to create new conditions on the international scene in the imperialist competition over the division of markets. In Latin America the trend toward creating alliances and advancing the processes of economic collaboration between its states is being reinforced, with a view to upgrading it to meet US pressures and dependencies. A trend is developing for the US positions in the international market to be lost or disputed. This loss of US positions is reflected: in the reduction of the US share of GWP (despite the fact that it holds first place); in the decline of the dollar exchange rate against the euro, especially in the past three years; and in the gradual recognition of the euro as an international currency, particularly in the oil market and above all by Iran, but also as the declared intention of other oil-producing countries (e.g. Venezuela). The EU as a whole strengthened its position in the international capitalist market. Contributing to this fact were monetary union, mergers and buy-outs, and the joint EU strategy of capitalist restructurings that permeates the economic policy of its member-states. At the same time, there is growing rivalry between the dominant imperialist forces of its member-states, in which two main axes are developing, the Franco-German and the British, with the latter being more closely associated economically, politically and militarily with the US, creating the so-called US-British alliance. The other, less powerful member states fall in with one of these axes, although inconsistently. The Germany-France alliance is demarcated by the separate interests of the two states. France is developing discernible cooperation initiatives in Eastern Europe, in Ukraine and in the Caucasus. It played a leading role in the new initiative of the "Mediterranean Union", a Euro-Mediterranean free trade zone, aiming to upgrade its influence in the region. The initial French government proposal was addressed only to EU member states bordering on the Mediterranean, so that France would acquire a leading role. Germany objected, with the result that a compromise proposal was worked out by the European Commission that included all EU member states. The US has created its own support within the EU, e.g. by forming an arc that includes the Baltic states, Poland, the Czech Republic, Hungary, Romania, Albania and FYROM, which act as a group in the deployment of the US missile "shield" in Europe and more generally in support of the economic and political interests of the US-British axis. Every alliance is governed simultaneously by countervailing trends (centrifugal and centripetal), both within itself and in relation to rival alliances. 9. The gradual rapprochement of Germany and Italy with Russia was based on the need of the two former states for oil and natural gas and on Russia’s need to expand its exports, not only by exporting oil but also by direct capital investments, chiefly by selling oil and its by-products to the huge EU market. The EU imports 50% of Russia’s total exports, while the lion’s share of Community exports to Russia is held by Germany, which holds first place in Russian imports. Russia has crystallised its strategic energy alliances with Germany and Italy in the North and South Stream natural gas pipelines and has utilised the countries through which they pass to increase its geopolitical influence within NATO (Bulgaria, Romania, Hungary). To the degree that Russian plans are realised, the rival plans of the US will be either weakened or cancelled. Capitalist Russia, with its enormous deposits of natural resources, its nuclear arsenal, and the infrastructures inherited from the USSR, as well as a skilled work force, has the prerequisites to upgrade its position in the imperialist pyramid. This eventuality does not constitute a guarantee for the peoples against the US and other imperialist centres – as was the case with the USSR, the socialist system and the Warsaw Pact as a whole – because the character of present-day Russia is imperialist. The gradual rapprochement between Russia and Germany was expressed by the outcome of the NATO Summer Summit of 2008 in Bucharest where no agreement was reached with the US on the immediate accession of Ukraine and Georgia to NATO. 10. Competition and centralisation are becoming more acute in other sectors of strategic importance as well, such as in telecommunications, transport (especially by sea and air), banking and manufacturing. The sharpening of intra-imperialist conflicts was likewise expressed at the World Trade Organisation (WTO) with the failure of the Geneva talks in 2008. This round of negotiations was dominated by the conflict between the EU and the US on the one side, and China, India and Brazil on the other, with the African and Asian states rallying behind the latter group. There were also conflicts between the US and EU within the WTO. The possible accession of Russia to the WTO further complicates these conflicts. 11. The vote against the "European constitution" by the peoples of France and the Netherlands in 2005, and against the "Reform Treaty", as the "European constitution" was renamed, by the people of Ireland on 12 June 2008, in conjunction with the increase of popular discontent and the growing tendency in all member states to dispute the EU, gives new thrust to deepening and stepping up the anti-imperialist struggle by the labour and popular movement, and for the labour and popular movement in Europe to become the pole of anti-imperialist cooperation and struggle, the countervailing force against imperialist wars, unpopular policies and their agencies, and a movement to break with and overthrow the EU. This positive development is very much dependent on the action and initiatives of the communist parties that have a clear-cut position about the nature of the EU as an interstate imperialist association, and on stepping up the struggle against reformism and opportunism. The EU and the bourgeois governments of its member states are intensifying measures designed to impose the European treaty against the will of the peoples. EU members are working out a joint anti-communist offensive and ideological terrorism more generally, strengthening state repression machinery and contrived reactionary notions to control the labour movement. The European Parliament is in the front ranks of the crude falsification of history with its anti-communist campaign that equates socialism and communism with overt forms of dictatorship by the bourgeois class, and by Nazi and Fascist regimes. 12. The "new" European treaty is a deepening of the Treaty of Maastricht, the four "fundamental freedoms" of capital and the Lisbon strategy of 2000-2010, with more regulations on the interstate level and, above all, greater deregulation in the movement of services and labour, such as a uniform status in the labour relations of mobile workers and employees, the abolition of closed trades and of restrictions on EU universities. For this reason, the precedence of Community law over national law has been reinforced, and abolition of the obstacle of unanimity by all member states is being promoted, so that particular interests and conflicts can be circumvented, despite the fact that the strong intra-imperialist conflicts inherent in the nature of the imperialist interstate association cannot be abolished, and indeed the tendency is for them to become stronger as the EU expands. In order to ensure a better position for European monopolies in international competition, a wide range of offensive EU armaments programmes is being promoted in the Common List of Military Equipment, as is statutory provision for imperialist interventions. The EU is reinforcing its repressive machinery and creating new ones, instituting police and judicial collaboration, and stepping up anti-communism in order to strike the vanguard of the labour movement, communist parties and the progressive movements around them, to confront the protests generated by the joint policy of intensifying exploitation by cutting back working class rights and gains in its member states. With the introduction into Community legislation of the Prüm Convention (Schengen III), collaboration between repressive machineries is strengthened and joint operations are instituted on the territory of member states. The operation and role of Europol is upgraded to the role of a statutory organ of the EU. In addition Frontex, the organisation that guards external frontiers, has been enhanced with groups of armed rapid deployment forces. The EU’s "new antiterrorist package", through a network of decisions and measures, creates a more reactionary legislative framework for striking the popular movement. It steps up the offensive by adopting action against "radicalism" and "extreme ideologies". The European law against terrorism been amended to include the "recruitment" and "training of terrorists" and the "incitement to commit terrorist acts" among "terrorist crimes". These terms can be interpreted and used by the bourgeois repressive machinery to describe the labour movement’s declared goals and forms of struggle as terrorist acts and to penalise them. Ideology and political action that lead beyond the limits of the capitalist system are penalised. The resources used to develop the so-called Area of Freedom, Security and Justice (AFSJ) are constantly increasing. The EU budget, although it has been reduced as a percentage of GDP, has increased the amount allocated for defence and foreign policy by 30%. The above trends and needs of capital have been recorded in the Lisbon Treaty, the re-named "European constitution", which is a step towards strengthening European unification. 13. The Lisbon Strategy is the product of an agreement by all governments of EU member states – centre-right and centre-left – and is implemented on the national level by the so-called National Reform Programmes, in order to accelerate capitalist restructurings by 2010. The goal is, by 2010, for the EU to surpass the US in competitiveness and productivity and to confront the future threat of positions lost to rising powers such as China, Russia and India in the future. To further reduce social security system benefits (pensions, health, welfare) and to increase their commercialisation. To abolish collective labour agreements and replace them with contracts for "alternative employment", work on contract for a specified period, part-time work, occasional employment, "zero hour" contracts, distance employment, and piecework. To deregulate dismissals. To legalise "slavery" bureaux and ensure the legal regulation of the so-called "tripartite employment relations", i.e. the "rental" of working people, so that businesses have no responsibility or obligation to uphold the labour legislation relating to them. Rulings by national and Community courts (Court of Justice of the European Communities) are moving in this direction, by characterising strikes as illegal and abusive, using the argument that they are opposed to "Community law" and "the four freedoms". The EU’s "fifth fundamental freedom" is being acclaimed as the freedom of movement for research scientists and the results of their work to the benefit of business profits. This framework supports the financing of research, while universities, public research institutes and their intellectual property are now being increasingly and directly subjugated to the plans and needs of capital. The EU takes advantage of the waves of migrants created by the imperialist system, using most of them as cheap labour, and to a large degree prevents their legalisation, thus fostering inhuman migrant camps. The revision of the Common Agricultural Policy (CAP) was followed by revisions of the Common Market Organisations (CMO) in a number of crops such as sugar, wine, fruit and vegetables, tobacco, etc. by disengaging support from production, abolishing intervention, reducing resources for agriculture and for support of the farmer’s income. Spending on agriculture has been reduced, dealing a sharp blow to the revenues of owners of small and medium-sized farm holdings. With the "CAP health check", the EU has initiated a new revision along the lines of full deregulation. The concentration of land and agricultural production, and of the processing and sale of agricultural products to monopoly groups is a strategic choice of EU capital. Extending the use of genetically modified organisms to agricultural produce in order to secure maximum monopoly profits has brought about a new decline in the output of local agricultural products and has increased dangers to the public health. The EU negotiates on behalf of its 27 member states within the WTO for more favourable conditions for the penetration of industrial products and services in developing economies, in exchange for purchasing their agricultural products. These agreements operate to the detriment of the agricultural production of member states such as Greece. The strategy of capitalist restructurings is not an extreme particularity of "neo-liberal" management, as the forces of social democracy and opportunism argue, thus consciously misleading the working people with regard to the reactionary nature of the EU. This strategy expresses the necessities of an entire historical period of capitalism on the international level, reinforcing its inherent tendency to export commodities and capital. During the period that has elapsed since our 17th Congress, the government coalition in Germany between the bourgeois liberal Christian democratic party and the social democratic party confirms their common strategy, as a continuation of the Maastricht Treaty and of capitalist restructurings globally, without abolishing the rivalry between them in management. The forces of reformism and opportunism not only accept the reactionary changes to the detriment of the working class, but also take part in its ideological-political deception, cultivating class collaboration with the contrived notion of "social partnership". They become carriers of the contrived and deceptive bourgeois notion of "tripartite collaboration" – i.e. the bourgeois state, plutocracy and compromised trade union forces. They participate in the manipulative mechanisms that the bourgeois state creates or fosters, such as NGOs, the Economic and Social Committee, the Institute of Labour, etc. that are generously financed to corrupt and buy off the working class in order to control the labour movement. Reformist and opportunist trade union forces that have denied the class struggle consciously undermine the rights and demands of the labour movement. The more capital steps up its offensive, the further forward it goes in organising its "fifth column" within the labour movement. On 1-3 November 2006 in Vienna, the "new" International Trade Union Confederation (ITUC) was established, through the merging of the International Confederation of Free Trade Unions (ICFTU) with the World Confederation of Labour (WCL) and Christian Trade Unions. The ITUC essentially constitutes a re-named ICFTU and operates as a vehicle of parasitism, corruption and the degeneration of the trade union movement. Chapter 3 The International Communist and Anti-Imperialist Movement. To work to promote a "more discernible form of cooperation with Communist and Workers’ Parties for the Communist pole" between the "Communist Parties that approach their ideological and political views, that defend Marxism-Leninism and the contribution of the socialism that we knew, as well as the necessity to struggle for socialism". The distinct presence of Marxist-Leninist communist parties does not remove each party’s responsibility to the working class and to the movement in its own country. It will have the form of common action and mutual support. To continue the effort to foster common action around anti-monopoly anti-imperialist goals with Workers’ and Communist Parties with whom we have ideological differences, rebutting erroneous ideological and political views. To continue to develop the Party’s contribution to the anti-imperialist movement, to international organisations of mass movements, and to the anti-war peace movement. International developments and the course of anti-imperialist struggles and developments in the international communist movement both confirm the correctness and the directions of the 17th Congress Resolution "On the situation in the International Communist Movement". The relevant work done by the 17th Congress was made available to the international communist movement, attracted great interest, was tested over time, had a positive impact on a number of communist parties and was further developed in bilateral contacts. KKE will continue to work in this direction. B. The ideological and political fight in the international communist movement. 15. During the time that has passed since the 17th Congress, the need has become even more obvious for communist parties and the international communist movement to regroup through efforts at common action, but also by intensifying the ideological battle against the opportunist views that hinder the formation of a communist movement with a united strategy in the struggle against imperialism, against the strategy of capitalistic restructurings and in the struggle for socialism. The International Communist Movement, despite any steps that have been taken, remains in a state of crisis, and is organisationally and ideologically fragmented. Its basic feature continues to be the dispute between revolutionary communist views and reformist, opportunistic ones, a fight that is under way in all regions and even inside a number of parties. At the centre of the fight is: the timeliness of Marxism-Leninism; the necessity and realistic prospect of socialism under the conditions of the temporary victory of the counter-revolution; the nature of imperialism and imperialist interstate associations; the strategy of alliances, and the stance of communists in the capitalist crisis and in intra-imperialist conflicts. The main issue is the attitude taken toward the building of socialism in the 20th century. The prolongation of the crisis in the international communist movement entails dangers of even greater backsliding. The revolutionary communist forces need to take initiatives to confront the crisis, which has a broader influence on the anti-imperialist movement of the peoples, and prevents the regrouping and counter-attack of the labour movement. The battle against social-democratisation tendencies in communist parties – through the intervention of imperialist mechanisms, anti-communism and the bourgeois media – must be fought firmly and consistently by defending the historic role of the working class and its organised vanguard, the principles of Marxism-Leninism and of socialism. This task takes on even greater significance in face of the growing anti-communist offensive in the EU and internationally. 16. The positions and course of the Party of the European Left (PEL), in which the SYN takes an active part, confirm that the PEL, since its founding, has constituted an institutional element of the EU, a force in support of capitalist restructurings, irrespective of its general proclamations. The activity of the PEL also confirms our Party’s prediction that it is the focal point of the attempt to change the nature of parties that retain the title of "communist" or that have preserved certain features to one degree or another, even if only formally. The diminished influence of some of the main parties in the PEL, which were in the front ranks of Euro-communism and today constitute the flagship of opportunism, is a logical development in their overall history. The PEL intervenes by supporting opportunist forces within communist parties in which a dispute has appeared. Its intervention extends as far as countries in Latin America, to the detriment of the revolutionary and anti-imperialist forces, where it systematically puts forward social-democratic views, supporting EU policy in its competition with the US for a share of the market. It cultivates the deceptive view that the EU is a countervailing force to US imperialist intervention in the region. 17. KKE can contribute from better positions to the regrouping of the international communist movement and to the development of the labour movement, the anti-monopoly and anti-imperialist struggle and the ideological front in the counter-attack against the bourgeois ideology and opportunism. The need for objective conclusions to be drawn from the viewpoint of the scientific theory of socialism-communism regarding the building of socialism in the 20th century has been more strongly demonstrated. Without such an assessment, even if it must be carried on leaving some issues still unresolved, it will not be possible for the communist movement to regroup or to achieve a formulation as comprehensive as possible of the strategy of the revolutionary labour and communist movement under modern conditions. This applies to all communist parties acting under any conditions whatsoever. KKE believes that any reluctance to investigate the reasons for the victory of the counter-revolution is equivalent to agnosticism, and leaves the field open to the anti-communist views of bourgeois ideology and opportunism. KKE considers that a serious effort must be made in the international communist movement to foster discussion, dialogue and the critical rejection and confrontation with contrived bourgeois and petty bourgeois notions about the nature of capitalist restructurings and views regarding "state intervention", "renationalisation", "world governance" and "market regulation". These fraudulent notions suppress intra-imperialist conflicts, unequal development and other contradictions. Objectively, they disorient people from the mature need for radical changes at the expense of the monopolies, imperialism and capitalist ownership. There is also a need to reveal and confront the false, contrived notion of the "socialism of the 21st century" which in essence, given the meaning that the phrase has acquired, alludes to a so-called humanised capitalism. Petty bourgeois and opportunist views that dispute the vanguard, leading role of the labour movement and the working class in general, as well as the social and class structure of the capitalist society must be confronted ideologically and politically. Views regarding the "disappearance" of the working class and the "new vanguard", which supposedly represents the middle strata that appear in conditions of capitalist restructuring, must be systematically refuted. Views of "non violence", "super-imperialism" and the EU "super-state" must also be refuted. The ideological front concerned with analysing the nature of the EU as an interstate imperialist coalition must be developed, and the erroneous view rebutted that the EU is preferable to the USA. The view must likewise be refuted that the so-called multipolar world can bring peace and security to the peoples. The multipolar world is revealed to be a world of sharpened intra-imperialist competition. In Latin America, but also more generally, an effort is being made to condemn and reject the armed revolutionary struggle, using FARC as the excuse. This political stance, which has been widely adopted by pro-imperialist forces, but is also supported by the forces of reformism and opportunism, concerns the armed struggle against occupation and the resistance to dictatorial and despotic regimes. It also concerns the development of the revolutionary movement, the right to protect one’s self against the repression and weapons of the bourgeois class and bourgeois political forces. In essence, this stance argues that the movement should abandon the policy of breaking with and overthrowing the system. The Party will continue its effort to promote common action around anti-monopoly and anti-imperialist goals with those communist and workers’ movements with which there are ideological differences, without waiving the right to critical discussion of these differences. 18. KKE continued and improved its efforts to develop bilateral and multilateral relations between Workers’ and Communist Parties. It increased the number of its contacts with more parties than before. It continues steadily to make its bilateral relations even more substantial, through the exchange of experience, discussions on theoretical issues, cooperation on individual fronts of struggle and especially on issues of common interest. It organised the exchange of visits that were in the nature of Working Groups on issues related to building socialism and to the international communist movement. At the same time, it continued its effort to develop common action on the fronts of struggle and to reinforce solidarity with peoples who are suffering from imperialist wars and interventions, ethnic violence and repression. It assisted the joint campaigns and interventions in national Parliaments and in the European Parliament against the victims of anti-communist persecutions, the ban on action by communist parties and on the use of communist symbols. 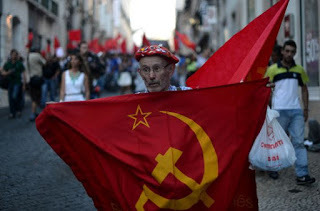 It contributed actively to ensuring that the Meetings of Communist and Workers’ Parties that began in 1998 and were held for seven years in Athens, and then held in Lisbon, Minsk and in 2008 in Sao Paolo, continue on a regular annual basis. Jointly with other parties, it proposed and worked to hold these Meetings in different countries every year, to form a Working Group with access to sessions of other parties, so that the theme of the Meetings can be determined collectively, to extend these Meetings to new Communist and Workers’ Parties that are being persecuted or re-established and having serious difficulties. It submitted concrete proposals and took initiatives to develop common actions. The International Meetings of Communist and Workers’ Parties (IMCWP) should continue. They should continue focusing on issues related to the struggle against anti-communism, to assessing the main trends in the modern imperialist system, to developing resistance against capitalist restructurings, to anti-imperialist solidarity, to the class trade union grouping, and to the struggle for peace and other movements on a national and international level. Utilising our positive and negative experience alike, we are required to take concrete measures to implement the annual directions for action formulated by the IMCWP and to encourage initiatives by parties and groups of parties, through the broadest possible dissemination and discussion. The Working Group needs to support and assist the implementation of these directions, continuing its basic task, which is the collective preparation for the Meetings. 19. Regional and issue-oriented meetings of Communist Parties should be held more frequently and effectively than in the past, as part of the process of jointly working out issues related to assessing events and developing the ideological and political struggle against bourgeois and opportunistic trends, neo-fascist practices, nationalism and chauvinism. The ideological front should be significantly improved on issues related to the international communist movement and the anti-imperialist struggle, so that it can respond in a more rapid and substantiated way, and deepen its assessment of struggles, demands and their results, especially regarding the struggles of the working class and young people. More generally, the need has become obvious for better and more systematic publicity for the issues that arise at the International Meetings of Communist and Workers’ Parties and at thematic and some regional Meetings, and for the Party’s tasks deriving from them. Also the better utilisation and contribution of party cadres and organisations, and of the Party more generally, is required in evaluating, utilising and advancing the Party’s international action. 20. KKE has taken the initiative of organising European seminars on issues related to education and of developing a campaign for free public education. It hosted three Meetings of Balkan Parties in Thessaloniki and Meetings of Communist and Workers’ Parties from the Eastern Mediterranean, the Red Sea and the Gulf region. It took an active part in the international seminars of the Workers’ Party of Belgium, in the thematic seminars held by several communist parties and in scientific conferences of Marxist scholars. It took part in regional Meetings of Communist Parties, as well as in the meetings of corresponding movements in Europe, such as the Meetings of Progressive and Left Parties of the Mediterranean; in Latin America, such as the Forum in Sao Paolo; and in Asia. It organised events with delegates from communist parties, such as the Portuguese Communist Party, the Communist Party of India (M), the Communist Party of Venezuela, the Communist Party of Bolivia, the Party of Communists of Mexico etc, which provided the CPG’s members and cadres with an opportunity to become better informed. Through the campaign and the European demonstration in Strasbourg and other actions, it contributed to the rejection of the Council of Europe’s anti-communist Resolution and to the development of a broad Europe-wide and international movement against anti-communism. It held solidarity events to protest the ban on the Communist Youth of the Czech Republic. It developed a new level of relations with the Communist Party of Cuba and the movement of solidarity with socialist Cuba. It organised a large and successful demonstration in Athens in 2006, in the presence of dozens of representatives of Communist and Workers’ Parties, a week of solidarity with socialist Cuba with mass events and marches in May of 2006, and a campaign to release five Cuban prisoners of the US. It strengthened its relations with a number of communist parties in Latin America, developed its solidarity with the struggles of the people of Venezuela and peoples that are fighting against imperialist intervention and war, such as in Lebanon and Palestine, and it took part in international mobilisations against NATO, G8 summit meetings, the WTO and others. It stood by the Cypriot people in rejecting the Annan Plan, and provides active support for the effort to find a just and viable solution to the Cypriot issue that is being developed on the initiative of the Cypriot Presidency with the collaboration of the Progressive Party of the Working People (AKEL), the Democratic Party (DHKO) and the United Democrats (EDEK). It supports the significant efforts to achieve rapprochement between the Greek Cypriot and Turkish Cypriot working people that have for years now been systematically and positively supported by AKEL and the youth organisation EDON. It took the initiative of organising mobilisations and sending a party delegation to visit Lebanon during the Israeli raids, and also to Palestine and Syria. It resisted the secession of Kosovo. It developed particularly close ties with the Communist Party of Turkey on a broad range of problems that connect the two parties, and showed its solidarity with the working class of Turkey in many different ways. Also significant was the internationalist action of the Party’s organisations, and the general increase in interest and participation. It promoted the common stance of Communist and Workers’ Parties from EU member states within the context of the struggle to break with the EU and its policies. 21. KKE should attach greater weight to cooperation between the Communist and Workers’ Parties of Europe against NATO forces remaining in the Balkans, and against the exploitation of minority issues, existing and non-existent. More systematic work should be done on the situation of the working people and the youth, the internal conflicts in the EU and the competition with the US and Russia. Issues should be discussed of the deficiency of the communist and labour movement, and failure to coordinate struggles on a Europe-wide level. Coordination and common action should be developed in view of the European elections. The Party should persist in fostering common action in the Balkans, in Europe and in the Middle East, and should also develop closer relations with Africa. Joint initiatives should be reinforced with Communist and Workers’ Parties regarding the rights of foreign workers and their integration into the class-oriented labour movement. It should contribute to ensuring regular meetings with Communist Parties from countries in the Middle East in order to develop solidarity. A discussion should be developed about supporting the labour movement in the region, about the anti-imperialist resistance to occupation, and about rejecting the plans for the "Greater Middle East" and the more general plans of the US, NATO and the EU. It should contribute to the further growth of cooperation with the Communist and Workers’ Parties of Latin America, and increase solidarity with the peoples of the region who are suffering from both a US offensive and EU efforts to intervene in developments to its own benefit. KKE will turn its attention more to cooperation and action in solidarity with the communist parties in the region that have resolved to retain their independent role and to contribute to deepening the anti-monopoly anti-imperialist struggle, refusing to be dispersed in coalitions. In these countries, constructive processes will only be effective and able to exert a more general influence, to the degree that the working class plays its vanguard role in the broader movement that is developing, and to the degree that it also plays a leading role in the social alliance with farmers and people with small businesses. 22. The first significant effects of the regrouping of the international labour movement have appeared on a global scale, in conjunction with the struggle against the opportunistic views inside it. The militant class orientation of the World Federation of Trade Unions (WFTU) is growing. The ever increasing participation of new organisations in its ranks and their experiences of various different conditions of struggle are proving to constitute a serious factor in internationalising the struggle of the class-oriented trade union forces and in strengthening their anti-monopoly anti-imperialist orientation on a higher level. KKE believes that PAME, the class grouping in Greece’s labour movement, has made a significant contribution to the effort to promote the regrouping and reorganisation of the international trade union movement and to the goal of expanding it with new union organisations so that its intervention will be strengthened on a global level. 23. The action and orientation of the peace movement have been considerably reinforced in an anti-monopoly anti-imperialist direction. The prestige of the World Peace Council has increased; new forces are joining its ranks. It has had a positive influence on the growth of peace movements in many countries in the world. Better conditions are being created to confront tendencies to dissolution and attempts to disorient the movement. Its increased contribution is based on the decisions of its most recent congress that was held in Caracas, Venezuela. 24. The international progressive women’s movement has not yet overcome the adverse effects of retreating from its anti-imperialist anti-monopoly orientation after the victory of the counter-revolution. The focus of the action and influence of the Women’s International Democratic Federation (WIDF) shifted mainly to the region of Latin America, where there are militant women’s organisations fighting against the strategy of the US imperialist interventions. Conditions are being created for improving the correlation of forces in the ranks of this international organisation. The Greek participation made a positive effort to develop the anti-imperialist struggle, which constitutes the main condition for rallying the masses of working women into the ranks of the movement and into common action with the international class-oriented labour movement and other progressive international organisations. 25. The international progressive youth movement which is expressed by the World Federation of Democratic Youth (WFDY) is going through a stabilisation period after its regrouping that took place with the contribution of some communist youth groups, including KNE. However, the difficulties and obstacles to its firm anti-imperialist orientation have not yet been removed. The primary goal is still to maintain and develop the anti-imperialist character and orientation of WFDY, especially to deepen it, so that it acquires resistance to the pressures and influence of social democracy and opportunism. The international youth movement needs to consolidate this orientation on the basis of modern conditions. It must rely more discernibly on a class-oriented analysis of developments and modern phenomena, and ensure a long-term strategy that does not fit into an imperialist context, that fights for the victory of the working class at the level of power, and for the victory and defence of socialism. NextPortuguese CP On the Elections in the U.S.
Communist Forum	Portuguese CP On the Elections in the U.S.